Cabrillo College Gallery Opening Reception Tonight!! This is a fabricated 19th century science narrative of the tropical island of Wallaceana presented as an installation of images, text and artifacts, explains artist Scott Serrano. The invented landscape of Wallaceana is named after the great 19th century naturalist and scientist, Alfred Russell Wallace, the lesser-known co-discoverer of the theory of evolution. 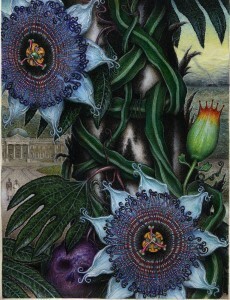 The installation and work pays both homage to 19th century traditions of botanical exploration as seen through the works of science illustration, and a critique of objective scientific representation. Thematically the work covers subjects such as the war in Iraq, human moral corruption, and social-political battles. The exhibit includes drawings and illustrations, documentation and notes, specimens, and daguerreotype portraits. Text panels written by the exhibition curator, Henry Walter Bates, will lend greater clarity to the purpose and importance of the installation. Bates, another 19th century explorer and biologist, established The Bates Institute for the History of Science. The Cabrillo Gallery will be temporarily transformed into a Victorian-Gothic science museum for the purpose of this installation. Exhibit runs February 15 – March 15. 7:00 – 9:00 PM. Parking can be found in any of the numerous metered parking areas.